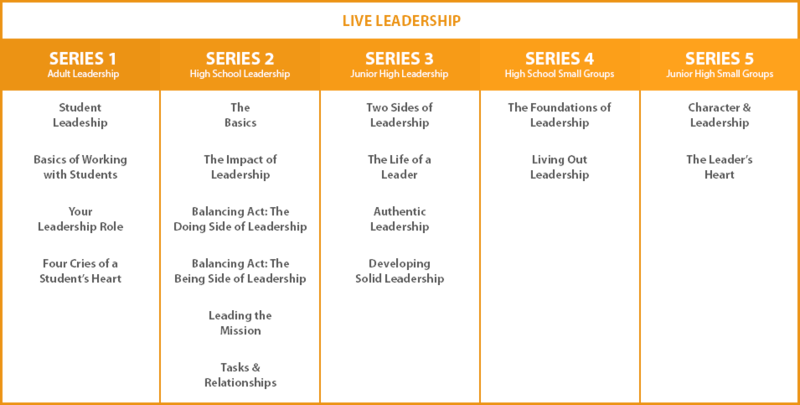 Build a biblical foundation for leadership in your youth ministry with LIVE Leadership. This dynamic resource provides a total of 60 lessons that will inspire and engage junior high students, high school students, and adult volunteers. This dynamic series will help you build a biblical foundation for leadership in your youth ministry. The lessons that will inspire and engage junior high students, high school students, and adult volunteers. Adult Leadership: 16 lessons equip adult volunteers to grow as leaders in your ministry. High School Leadership: 24 lessons inspire high school student leaders to step into greater roles of responsibility. Junior High Leadership: 8 lessons introduce junior high student leaders to foundational leadership truths. High School Small Groups: 8 lessons focus on topics such as becoming authentic leaders and developing solid leadership. Junior High Small Groups: 4 lessons focus on building personal character and nurturing a leader’s heart. Bonus: A comprehensive document will help you build a high-performance student-leadership program. Maximize Impact: Help young people and adults discover indispensable biblical principles that are relevant both to daily life and to youth ministry. We’ve partnered with our good friends at LeaderTreks to help your students and adults discover indispensable biblical principles that are relevant both to daily life and to youth ministry. LeaderTreks has built a solid reputation as a national ministry committed to helping congregations pursue the goal of consistent leadership development within youth ministries. You’re in youth ministry, so we know you can’t say no to free food. You also can’t say no to bonus resources, right? That’s why we’ve included a comprehensive document that will help you build a high-performance student leadership program. How cool is that? 60 lessons that will inspire and engage junior high students, high school students, and adult volunteers.